DUBOIS – Charges have been filed against a Luthersburg man accused of aiding in his estranged girlfriend’s suicide, according to court paperwork obtained from Magisterial District Judge Pat Ford’s office. 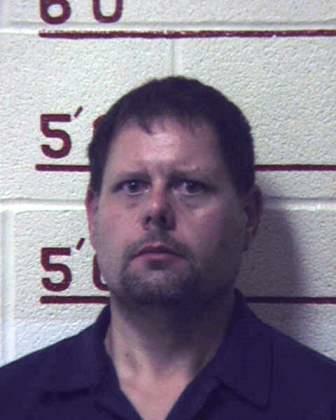 Brian Lee Schaffer, 44, of Luthersburg, was charged Thursday by DuBois City police with criminal homicide, F1; aiding suicide, F2; involuntary manslaughter, M1; and manufacture, delivery or possession with intent to manufacture or deliver, F.
According to the affidavit of probable cause, police were dispatched to a report for a female gunshot victim Jan. 2 on Grant Street in DuBois City. Upon arrival to the scene, police made contact with Schaffer, who allegedly stated that the victim had shot herself but was still breathing in the living room. Police observed a small, silver pistol that was allegedly laying to the victim’s left on the floor. “The positioning of the gun did not appear to be consistent with falling from [the victim’s] hand after firing but as if it was moved afterwards” police stated in the affidavit. The gun, according to police, was a .380-caliber Bersa semi-automatic pistol that belonged to Schaffer. A single .380 casing was recovered by police at the scene. DuBois Emergency Medical Services arrived at the scene and started to provide medical care. The victim was then transported to the emergency department at Penn Highlands, where she was pronounced dead. Police interviewed Schaffer immediately after the victim was transported to Penn Highlands on Jan. 2. Schaffer told police he was upstairs when he heard a gunshot; he ran downstairs and found that the victim had shot herself. Schaffer later changed his story, stating he heard the back door shut and went downstairs to find the victim with the gun. Schaffer stated that he told the victim to put it down but when he ran to stop her it went off. Due to conflicting statements, police requested that Schaffer submit to a polygraph examination on Feb. 19 with the Pennsylvania State Police. During the examination, Schaffer allegedly admitted that he had previously lied to police. Schaffer allegedly stated that he and the victim were arguing on and off throughout the night and into the early morning hours of Jan. 2. In order to settle their argument, Schaffer allegedly retrieved his gun from his truck. Schaffer returned to the living room with the gun. When the victim allegedly demanded to see the gun, he handed it to her empty, and she wanted to know where the bullets were. When he showed her the loaded magazine he allegedly stated she wanted him to show her how to load it. Schaffer stated he loaded the gun while the victim held it. Also, he stated that he must have chambered a round for her because he doesn’t keep it that way. Schaffer said when the victim threatened to shoot herself he reached for it, but it went off. Schaffer wasn’t sure if his hand was on the gun when it went off. However, he denied pulling the trigger or there being any struggle for the gun. He stated that the gun only fired once, striking the victim in the temple. Schaffer allegedly stated he couldn’t watch the victim suffer. He allegedly picked up the gun and was going to shoot her and then himself. Schaffer stated that he couldn’t go through with it and called 911. During the examination, he also allegedly admitted to buying methamphetamine and bringing it to share with the victim. He allegedly stated that the victim had consumed a lot of methamphetamine, and he had quit using sometime around midnight. Schaffer allegedly stated that he and the victim had been using methamphetamine for three or four days straight prior to the incident. Another witness confirmed in an interview with police on Feb. 20 that there was methamphetamine in the residence, Schaffer had purchased it and they were all using it. An autopsy was performed on the victim at the Lehigh Valley Health Network in Allentown on Jan. 3. The findings concluded that the victim died of a single, gunshot wound to the head. During the examination, suspected bullet fragments were recovered from the wound. A toxicology screening also showed that the victim had methamphetamine, ethanol and amphetamine in her system.